What does Account Owner mean? From time to time, you may want to generate a backup copy of your account information, whether for tax purposes or simply for your personal records. 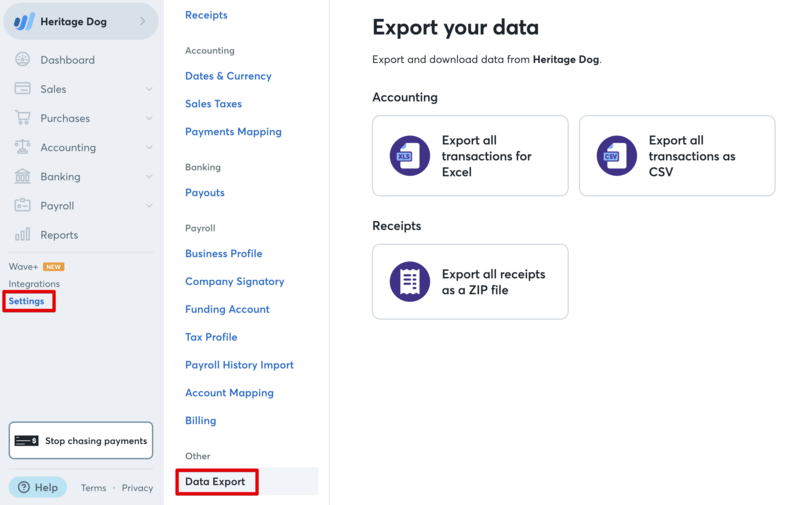 Your data export contains your accounts, general ledger, journal entries, and transactions. Scroll down to the bottom of the menu that appears, and click Data Export. Under the Accounting heading, choose the format in which you want to receive your export. You can export for Excel or as a CSV. You can also choose to export your receipts. The export will be sent to the primary email address you use for Wave. It may take a few minutes to arrive in your inbox. The download link you receive is active for 24 hours, so make sure you download your export in that timeframe! If the link expires you will need to perform the export again.